This blog entry about the events of Saturday, June 27, 2009 was originally posted on August 01, 2009. EARLIER THAT MORNING, with the help of a woman at the Tourist Information Center by the Jaffa Gate, I managed to be put in touch with the Church of the Nativity in Bethlehem to ask about the mass schedule on that bell-ringing Sunday morning. “Here, you try,” the woman said to me, passing me the phone after her unsuccessful attempt to get any information from them. “They only speak Italian.” I took the receiver and waited for a voice. “Allo?” said the Italian-accented voice on the other end. “Uh, hello… Parle inglese?” I asked, reverting to the limited Italian from my jaunts in Italy. “Allo?... Allo?” said the monk’s voice. “Momento,” he said before saying something really fast in a commotion like he was going to try and find someone who could speak English. He put me on hold, complete with hold music: an instrumental version of “Silent Night.” I couldn’t help but chuckle. “Allo?” said a new voice. “Uh, cuando es los servicios de iglesia?” I said in Spanish, knowing that Spanish has sometimes gotten me through Italian conversations. There was a rustling of the phone on the other end, followed a continuation of the hold music. Finally, another voice, but the same ordeal. This Abbott and Costello routine went on another round (with more hold music), and in the end, I finally got the one pseudo-English-speaking monk. AMERICANS MAURICE AND WILLA, Scottish Miriam, and I walked through Old Jeru’s Arab shuk to the Damascus Gate, where we were told we could get the No. 21 bus to Bethlehem. Although just on the outskirts of the city of Jerusalem, the birthplace of Jesus Christ-ianity is technically on land governed by the Palestinian Authority, behind the wall and checkpoint of the West Bank, where Israeli buses dare not service. Fortunately there was the alternative bus system that would take us there, which was easy to find with the help of some friendly Palestinian passers-by showing us the way. “So is this an Arab bus or an Israeli bus?” Miriam asked her new American friends. “Sorry, I just had a blonde moment,” Miriam said, embarrassed but smiling; she was still waking up after a long night of boozing. Plus running around the Old City that morning to find the bus wasn’t helping either. “This is a lot of work for a Sunday morning,” she had said. In only about fifteen minutes we had driven through the Israeli/Palestinian checkpoint and were dropped off near the town center of “O Little Town of Bethlehem” — although “little” no longer applies these days, for Bethlehem is now a bustling city housing a big university, multiple chain hotels, and restaurants. After getting our bearing, we followed the Lonely Planet map up the nearby hill and into “a proper Arab shuk” as Maurice called it: a present-day-looking, bustling strip of stores and vendors hawking everything. We used the occasional steeples of Protestant churches as trail markers to eventually led us to the main attraction, the Church of the Nativity. The world’s oldest continuously-operating church since 326 A.D., this basilica (picture above) built on the site of the world-famous manger was a sight to behold, especially for the millions of Christian pilgrims that come in by the busload. The first room was dim, boasting rows of columns from the original 4th-century construction, and a display of the old and new mosaic floors. Up ahead was the ornately-adorned alter built above the actual birthspot of Jesus, and next door, in the 19th-century Church of St. Catherine, was another alter actually being used for Sunday mass. We had missed the English and Polish mass, so Willa and I attended the mass in Arabic for a little while. Willa didn’t last too long, still trying to recuperate from the night before. “Look there’s a Christmas tree!” Miriam pointed out in the courtyard where Willa took a short time out. Of course THE reason to be in the church was to see the Grotto of the Nativity under the altar where the baby Jesus was born, accessed through a small stairwell on the side. Needless to say, it was mid-morning and primetime for all the Christian pilgrimage tour groups, and it took some time for Willa and me to make our way down there with the crowd. As we entered the claustrophobic space, Italian pilgrims harmoniously sang hymns in praise of their Lord, and I’ll admit that amidst the chaos it was a bit stirring. But the vibe was short-lived; with the extreme heat and sweat of crowded bodies, people actually started fighting over getting to venerate the tiny, fist-sized but adorned spot of the birth of Christ. Willa and I finally got to the spot for our quick glimpse of the sacred spot and left before being overwhelmed by the crowded mob of people. When we regrouped with Miriam and Maurice, Maurice told us that he’d sweet-talked his way with the guard at the exit stairs and got in to see it without much waiting. “I just told him I was going back to look for someone and went right in,” he told us. BACK OUTSIDE THE CHURCH GROUNDS, I could hear the Christian songs from a choir in one ear and a Muslim call to prayer in the other from across the street. We left the site of the Nativity, but wandered around the Manger Square area of Bethlehem, near the Bethlehem Peace Center. At a nearby tourist information board, there was no map of how to get to other points of interest. Instead there was a map and information about the Palestinian plight with the Zionist Israelis. While the info board’s entire report of the Palestinian/Israeli conflict from the Palestinian viewpoint can be read on this website, in a nutshell, it spoke of the occupation the Israelis have over Palestinian land, an occupation that has grown over time since 1946. It was eye-opening to see this perspective, but it’s not like I hadn’t heard of it before; Teresa, the Harvard grad-turned-Let’s Go researcher/writer had once mentioned how Al-Jezeera news still refers to the Israelis as “the colonists” in their Arab perspective news reports. She also spoke of how the Palestinian family that ran the Old Imperial Hotel (where I was staying in Jerusalem) had been threatened to be forced out of their business by Zionist developers via legal loopholes, in a sort of gentrification or “semitification” process. The information board continued with the Palestinian perspective — which called the current state of affairs “the apartheid” — about Palestinians being ousted from their homes, adding to the growing number of refugees, and how the imperialistic state of Israel has repeatedly broken UN Peace Treaty agreements by continually building Jewish settlements on land designated to the Palestinian Authority. “That must be it. That cookie-cutter development over there,” Maurice pointed out from a nearby vantage point, referring to an illegal Jewish settlement in the West Bank mentioned on the board, just on the outskirts of Bethlehem. THE SUN WAS REALLY HEATING UP by this time, but we found shady refuge in the Bethlehem Peace Center to sit and figure out our next move. Needless to say, Palestinian politics were fresh in our minds and conversation. I chimed in with a tidbit I’d heard the day before from Howard, the Presbyterian minister and studier of theology, “I heard that the Dutch settlers of South Africa pulled from the same scripture of the Torah to deem themselves ‘The Chosen People,’ and no one else mattered.” It was this supposed scripture that spawned the former state of segregation in South Africa, which I guess was also evidentally the case in Jerusalem; I mean, we had to go to the other segregated bus terminal just to get to Bethelehem. Maurice, Willa and I looked at each other dumbfounded again at the blonde moment. “Uh, it’s that state of segregation between the blacks and the whites in South Africa…” I explained after the awkward pause. Coffee was preceded by a delicious pasta lunch at the nearby Casa Nova restaurant adjacent to the church, which was more like a Roman Italian colony than an Israeli one, with its decor and Italian waiters. We lightened the political conversation for Miriam — she had no idea of the Palestinian/Israeli conflict and had gone to Israel simply for its warm weather for “a beach holiday” — and our subject matter progressed to one of travel and food. I mentioned to my new friends how I had recently started a website where I take fast food and make it look fancy. “LET’S KEEP WITH THE CHRISTIAN THEME,” Willa said to me back in the Old Jeru, suggesting we do what the Lonely Planet book referred to as a “Walking Tour” — the authors’ secular labeling of the Stations of the Cross route, which followed the believed path of Jesus Christ as he carried his own cross to his crucifixion site. In remembrance of Good Friday, the day it all went down according to the New Testament, the Franciscan priests walk and pray along the route each Friday of the year. However, it was Sunday and we were on our own. And by “on our own,” I mean on our own because with the confusing maze that is the Old City — especially away from the more frequented area between the Church of the Holy Sepulchre and the Western Wall — the four of us had easily become separated after a slight detour we had to take because it was the time of day that parts of the Muslim quarter were for Muslims only, and we couldn’t cut through as the map directed us. Maurice stopped for a quick shawarma, and then Miriam for something else, and before Willa and I knew it, the two of us were on some random street in the Old City without a clue to where we were. Perhaps that was because Maurice had the only map amongst us, and we were trying to find our way simply from memory and a false sense of direction. We all knew that we were to meet up at the Lion’s Gate, near the first Station of the Cross if we got separated, but getting there involved many wrong turns since everything looked the same. Pretty soon Willa received a text from Miriam saying that she was going back to her hostel, because she was looking obviously lost wherever she was and was being subject to constant hassles from local men. After taking way longer than expected, we eventually found the Lion’s Gate, hoping to find Maurice there — but he wasn’t. “He’s… a black guy,” I answered when a Palestinian shopkeeper near the marked site of Station No. 2 asked to describe our friend in case he’d seen him — he was chatty and I pegged him for touting his store. With a no show, Willa and I gave up and decided to start the tour on our own — but then couldn’t find the first station, only the souvenir shop named after it. Fortunately we were near the exit of the underground tunnel Kotel tour, and a friendly, armed Israeli guard pointed the way; it was right there, above our heads on the top of a ramped entrance to an Islamic College. We were happy to have found it, but happier when Maurice finally showed up. I turned to my American friends and noted, “There they go perpetuating the fear again.” It was sad really; it was this perpetuation of Jewish fear that kept Jimmy Carter’s notion of apartheid alive. I had hoped that the fear would dissipate as new generations came to be, but the tour guide was speaking to kids in the group as well, who might continue that fear in their later years and pass it on to the next generation. Case in point, when the three of us stopped a few feet away to take a photo at Station No. 2 and chatted up the shopkeeper there — “I was just trying to help,” he said — I noticed the Israeli guard keeping an eye on us, as if he was suspicious that trouble was imminent and he would need to save the day. We were defying the Jewish tour guide’s advice not to take pictures, after all. “Yeah, but he was carrying a cross and went up these stairs,” I argued. “Whether you believe it or not, the history of this is amazing,” Willa raved. THE LAST REMAINING FIVE STATIONS OF THE CROSS were within the Church of the Holy Sepulchre, and we continued inside. Unlike mid-day with its crowding of busloads and busloads of Christian pilgrim tour groups, dusk brought forth a solemn calmness that you’re supposed to get in a spiritual setting. It was the perfect time to visit the church this time; no crowds, no intense heat, and no confusion like my first time there when lost my group for an hour. In the Greek Orthodox Chapel, there weren’t hundreds of camera flashes trying to take pictures of priests; this time a lone priest could actually pray in peace. Maurice wandered around to take photos, leaving Willa and I to visit the final station of the cross together: the Holy Sepulchre, a.k.a. the Tomb of Jesus Christ. I almost didn’t recognize it without the hundred people in a queue waiting to go inside and venerate it. With little wait time, Willa and I bowed through another short doorway of humility, and each spent a moment in one of the holiest places in the Christian world — one of the most significant places in world history as well. I kneeled with the faithful and felt an ethereal presence, and did a sign of the cross. Inspired by this moment of overwhelming Christian spirituality, I wandered the rest of the church on my own. 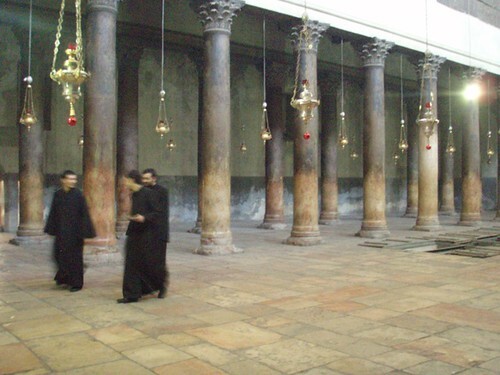 I noticed some candles lit around the Holy Sepulchre — one had fallen on the floor, extinguished. I picked it up, lit it with another’s flame, melted some wax down, and stood it up on its own. It was the make-up candle I lit for my newly-baptized niece Mia, after that whole candle-extinguishing debacle at the church in Nazareth. I found Willa and Maurice again shortly thereafter. Maurice hadn’t been inside the tomb yet, so Willa and I waited for him. “Looks like you just beat the rush,” I told him. A new, late afternoon tour group had just arrived to queue for veneration of the holy site. “I’m so glad I got to do this before I left,” Willa said as we left the church grounds, concluding our walking tour of the Stations of the Cross. “Well, we did the birth and death of Jesus Christ in one day,” I told my friends. We headed back out to the alleyways of the Old City, and eventually ended up at an outdoor cafe for a final evening together — with Andrea and Adrian, two new travelers we befriended there — for shawarma, hummus, drinks, hookah, and some more photos — no matter what a Jewish Kotel tour guide, Jesus Christ, or Jimmy Carter had to say about it. At 22, Strasburg chanel necklace has demonstrated how immediately valuable mens belt an elite draft choice can dior jewelry be. Experts said he has cheap pendants already paid for his $15.1 louis vuitton replica watches million bonus based solely on love links jewelry the marketing and attendance gains dolce gabbana watches he produced both at home bvlgari jewelry and on the road. cheap nike shoes won great honor for world production and supply of comfortable Nike Air Griffey Max to consumers around the lot. Nike Dunks were originally produced for the basketball team until 1985. Over time, these dunks shoes became very popular with audiences and new styles were introduced. They are publicly known for their durability and comfort. nike air force 1 These basketball shoes have changed category to a fashion icon for allPeople. nike dunk high invested a lot of experience with the latest technology and best quality raw materials for the manufacture of Nike air max 90. The result of all these efforts, the sense of the consumer, nike air jordan safety and comfort. Many people do not know how to separate life are the nike basketball for play and daily, but they do not want to compromise on quality. air max 2011 is designed to meet these needs and provide quality, lebron james shoes. You can bring in your daily life and during the gamerequire pivoting and jumping, etcThis is so interested! Where can I find more like this?